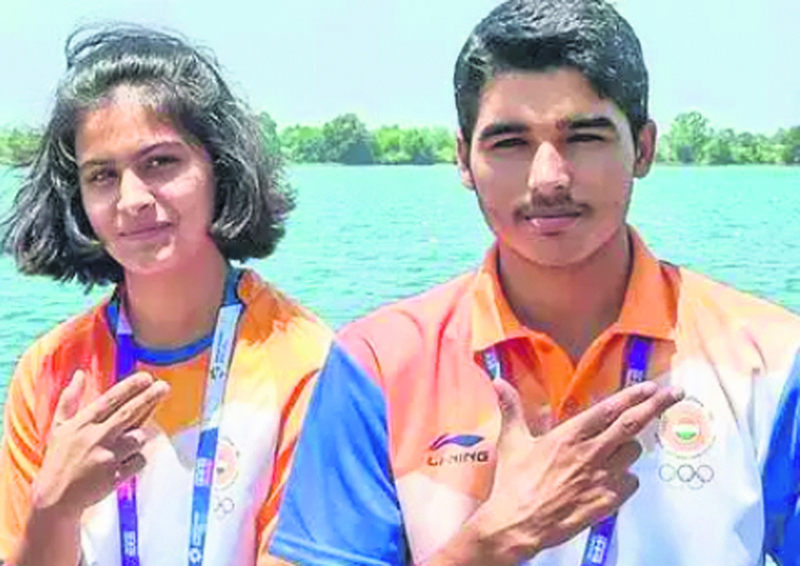 Teenage Indian shooting stars Manu Bhaker and Saurabh Chaudhary smashed the world record before clinching the 10m air pistol mixed team gold in the 12th Asian Airgun Championship in Taoyuan, Taipei. The 17-year-old Manu and 16-year-old Saurabh shot a combined score of 784 in the qualification round, breaking the record set by Russians Vitalina Batsarashkina and Artem Chernousov at the European Championships five days ago. The Indians then went on to win the five-team final with a score of 484.8. Their feat came exactly a month after they won the International Shooting Sport Federation (ISSF) World Cup stage gold in the same event in Delhi. A second Indian team comprising of Anuradha and Abhishek Verma also reached the finals and finished fourth with a score of 372.1, the National Rifle association of India (NRAI) said in a statement here. On the second day Indian shooters clinched one gold and two silver to remain on top of the standings. Ravi Kumar and Elavenil Valarivan won a silver in the senior 10m air rifle mixed team event while India made it a 1-2 in the corresponding junior event on yet another profitable day. Ravi and Elavenil topped the qualification rounds with a score of 837.1 but were beaten in the five-team final by the Korean pair of Park Sunmin and Shin Minki. The Koreans won the gold with a score of 499.6 to the Indians’ 498.4. Chinese Taipei won the bronze. A second Indian team consisting of Deepak Kumar and Apurvi Chandela finished fourth. In the junior 10m air rifle mixed team event, two Indian teams made it to the final round. The pair of Mehuli Ghosh and Keval Prajapati topped the qualification round with a score of 838.5, while Shreya Agrawal and Yash Vardhan qualified in second position with 831.2. Shreya and Yash, however, turned the tables on their compatriots in the final, piping them by a margin of 0.4 points. Mehuli and Keval led throughout the final and they opened up a gap of 1.6 points over Shreya and Yash going into the final six shots. But, the pair of Shreya and Yash overturned the deficit, finishing with 497.3 to Mehuli and Keval’s 496.9. Korea won the bronze in the event. With five medals in its kitty, India is on top of the standings.